SRL members Daniel Aldana Cohen & Max Liboiron have published a summary and update of The Tale of Two Sandys in the latest edition of Metropoltics in time for the two year anniversary of Sandy’s landfall in the region. We summarize the two Sandy framework, and then move on to describe the second Sandy based on recent research by community- and advocacy-based organizations. The first way of understanding Sandy is as an acute, disruptive event. This perspective is most common among governing and elite institutions such as large NGOs and foundations, the entities that exercise the major share of authority and influence at the municipal and state levels. It understands Sandy as a severe, but relatively short-term, interruption of normal city functions and focuses largely on physical infrastructure. The recovery goals inherent in this frame have been to repair interruptions to the pre-storm status quo of New York City as a stable, global cultural and economic center as quickly as possible, with a significant focus on strengthening infrastructure. The second way of understanding the storm, most common among community groups and grassroots political networks, is that Sandy sharpened and exacerbated systemic problems. This perspective sees Sandy’s impact as intensifying an ongoing crisis stemming from social and economic inequality. The recovery goals inherent in this frame are focused on pairing shorter-term triage with longer-term transformations of the underlying sources of vulnerability and economic insecurity, namely inadequate housing, precarious employment, and inaccessible essential services. In the case of public housing, more than 80,000 New Yorkers living in over 400 New York City Housing Authority (NYCHA) buildings lost key services like electricity and elevators when the storm struck. 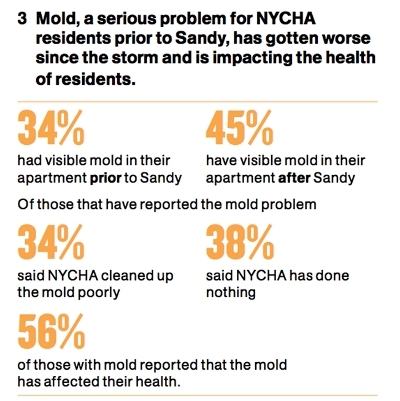 According to a survey of nearly 500 NYCHA residents, 55% had repair needs in their dwellings before Sandy, 40% developed new needs because of Sandy, and 62% were told they would have to wait six months or more for repairs. The table below shows, for example, how Sandy worsened widespread preexisting mold contamination (Alliance for a Just Rebuilding et al. 2014). Source: Alliance for a Just Rebuilding et al. 2014.